This year started off on the right foot – only fourteen days in and we were exploring a new cave. On January 14, 2017 I woke up early to re-check the equipment and tools. I sent a message to the team and to my surprise they were ready. I was nervous. It was my first time as a leader, inside a new cave and the one who’d have to make all the decisions. 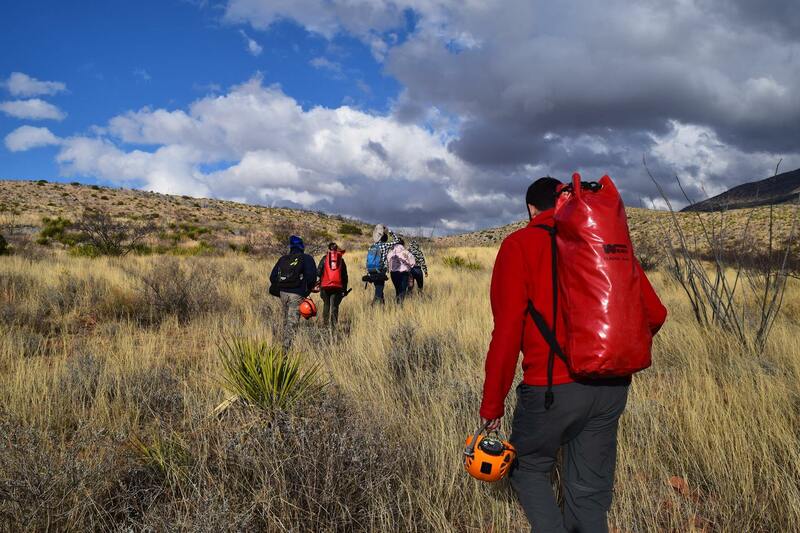 I did not mention this to the Sonora Pioneer Speleological Group (G-PES) team – Melissa Sanabia, Jose Romero, Luis de la Fuente and Eduardo Gracia. The owner mentioned that the cave was discovered by Sergio Santana, a Mexican speleologist who was invited by the Comisión Nacional de Áreas Naturales Protegidas (CONANP) and that he had evaluated the cave’s potential for tourism. Santana explored the cave in 2011 and told his dispatchers that with infrastructure, the cave would make a fine attraction. But we’d heard this story before. It was the reason we were there. All the same, we felt something was missing. At 2pm, we ate quickly and prepared our personal equipment. The expedition had two objectives: survey the cave and corroborate Santana’s report. Six years had passed and the cave is still waiting to welcome its first tourist. We brought everything inside our sacks: helmet, headlamp, extra batteries, extra light, rope, aid kit, camera, food, water and tools with which to survey the cave. Nobody knew how much time we would be underground. We left the Jeep Cherokee on the road and started to walk. Our guide was Mr. Raymundo himself, accompanied by his relatives Nidia and Estefany. We followed them and I was the last person in the line. As we walked, my anxiety increased. Even after reading the work of Sergio Santana, I did not know what to expect, though I saw something singular: there was not one hill nearby. Most of the caves explored by G-PES members were located beneath hills. This time, we were walking through grassland. Suddenly, I got excited. This cave would be different from all the others. And indeed it was. On our way to Cueva “La Mora.” Credit: Eduardo Gracia. The entrance of the cave is a pit about six meters deep with a berry tree inside the hole. It is the only tree for kilometers, in the middle of nowhere. That is the reason they called the cave “La Mora,” which means berry in Spanish. Our ropes were not necessary – the owner had installed stairs and we descended easily. Seeing the stairs, we realized how much Mr. Raymundo wanted to open the cave up for tourism. Having found the real entrance, a half-meter-wide breach, we crawled to enter the first room. The sunlight is still visible in this second chamber and we used its light to guide us. Nidia Gámez, Estefany Hoyos, Melissa Sanabia, José Romero, Luis de la Fuente, Eduardo Gracia and I began exploring the cave. At the outset, we found two ways and chose the right one which was longer and deeper. The first chamber is a great hall ringed by different speleothems: stalactites and stalagmites everywhere. 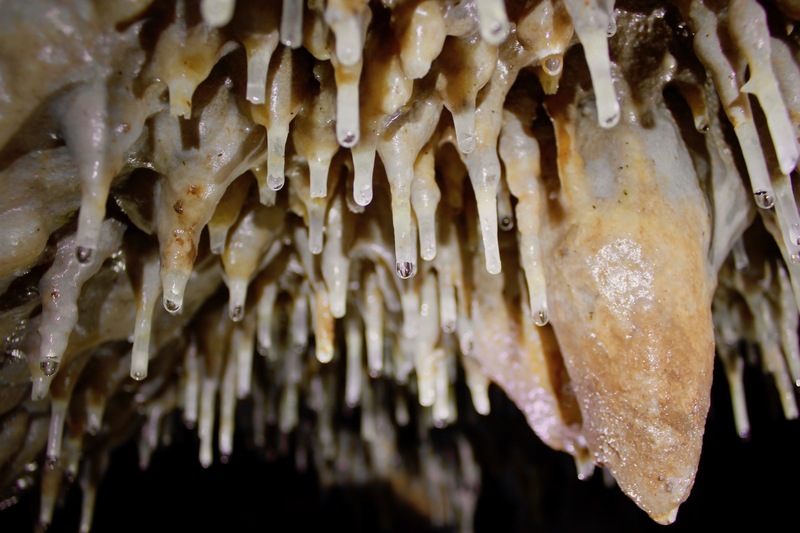 We moved without trouble – the speleothems were out the way – and move inside quickly. The next zone was a 100-meter-long path composed of several crawlways. We went deeper and deeper, found tiny pools, growing stalactites and stalagmites, mud and fresh guano. The guano was something we wanted to see. The guano was something we wanted to see. For the team it was a flag: if there is guano, by logic bats use the cave. We did not know if they were roosting there or hibernating but they were present and Mexico has various endangered species in the vicinity. We took notes. In a great numbers of caves, guano is the principal source of energy and there are species of invertebrates and vertebrates who feed on it. We always search for species close to or inside the guano. Sure enough, we found cave crickets – with long bodies and legs that make them look like spiders – and a millipede inside the guano. We were not sure whether it was a new species for Sonora or Mexico. In fact, it's very common to find new species in caves. Conditions for life are hard and not much can live there. Those that can have adapted to survive subterranean environments and complete darkness, constant temperatures, high humidity and a dearth of energy sources. Growing stalactites. Credit: Luis de la Fuente. Continuing our trip inside the cave, a muddy section made it risky to walk. I recommended everyone sit and move carefully because it was wet. The G-PES team moved without trouble but suddenly Estefany slipped when she was trying to sit and hit the wall in front her with her helmet. The force of the impact knocked it off her head. I was really concern about the accident. It happened over just a few seconds but I saw everything in slow motion. I moved quickly but cautiously and help her as she tried to stand up. I asked her how she felt and her answer calmed me down. “I am fine, don’t worry,” she said with a smile. “How is it possible that your helmet fell off?” I asked. She had forgotten to lock the chinstrap. We laugh but I knew it could have been a lot worse. My first time as an expedition leader and we almost had an accident. Cave rescue is always complicated. Even in the easiest cave, it can take hours or days to remove someone and we were not totally prepared for a rescue. The G-PES team: (left to right) Melissa Sanabia, Luis de la Fuente, Omar Calva, Eduardo Gracia and Jose Romero. Credit: Luis de la Fuente. When we reached the deepest part of the cave, we saw that people had written names and dates in the mud and they had been preserved well. Some inscriptions were from the 1950s. We headed back to the entrance, where Mr. Raymundo Gámez was waiting for us. We saw the time and its almost 8pm. Mr. Raymundo, Nidia and Estefany left the cave and we split into two teams. Melissa and Luis focused on photographing the cave and Jose, Eduardo and I surveyed and measured its temperature and humidity. Together, the tasks took three hours. We also visited and surveyed the left chamber, that was characterized but two huge columns – which happens when stalactites and stalagmites unite – in the middle of the hall with several slimmer columns surrounding them. That hall and its speleothems terrified us because the shadows created by our headlamps played with our minds. We thought we were seeing silhouettes. We finished our work at 11pm and it was raining outside. We walked to the car through the rain and an ambient temperature of 4 °C. Inside the cave, it had been around 20 °C. We had completely forgotten that it was winter. We reached the Cherokee and I drove to the cabin. We went to sleep immediately. We had been underground for seven hours. In the morning, we shared our observations with Mr. Raymundo. We told him about the bats and the possible endangered species. If a species on the IUCN red list used the cave, we told him, the tourism project could not continue. Also, we did not know the status of the cave cricket and millipede. I drove back to Hermosillo. We slept well and on the freeway we started singing. Like true Mexicans, we stopped in Imuris to eat some tacos. Our expedition was a total success. Even though we almost had an accident, I felt prepared to lead the next trip. Back home, we added up the data and found the cave’s size increase by 100 meters compared with the map by Sergio Santana. We had used lasers to make our measurements. As it stands – or lays – the cave is 300 meters long by 24 meters deep. It is not the longest and deepest but, from my point of view, it is the most beautiful cave in Sonora. Omar Calva is the co-founder of Mexico's Sonora Pioneer Speleological Group (G-PES).